Use the Export Records Screen on the Tessera Home Screen to export all data out of Tessera for times when you want to either analyse data in other programs or move Tessera data to another platform. Usually you’ll be exporting sets of records from the People or Artwork Components of Tessera. You’ll have conducted a search for a range of people or artworks that you want to move to applications such as MS Excel or MS Word. 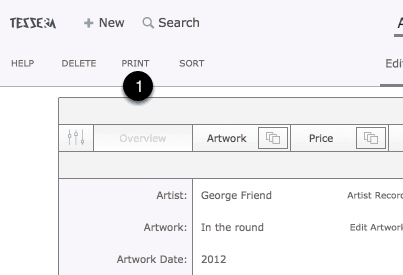 Once you’ve found the records in the People or Artworks Component to export choose the Print button and select to export the records. Here the Artwork export screen is shown but the features are much the same for the People Export screen. The green column allows you to choose from a list that decides the export order and what data is exported. The available options include the main fields from the Artwork or People Component. Use these buttons to clear any entry already made. The result is shown in this column. Use the controls to move through the records to be exported. If the selected records include images you can select to download all associated images to a specified location. Use this button and follow the prompts to save the images to a specified folder.